She’s trouble—with a capital T.
If she wants a war, she’ll get one. 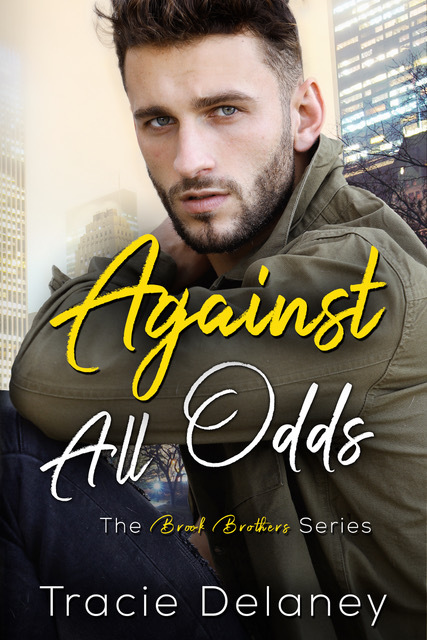 Against All Odds is an enemies-to-lovers Contemporary Romance set within the Brook Brothers series. Each novel can be read as a stand-alone or, for a fuller experience, in series order. 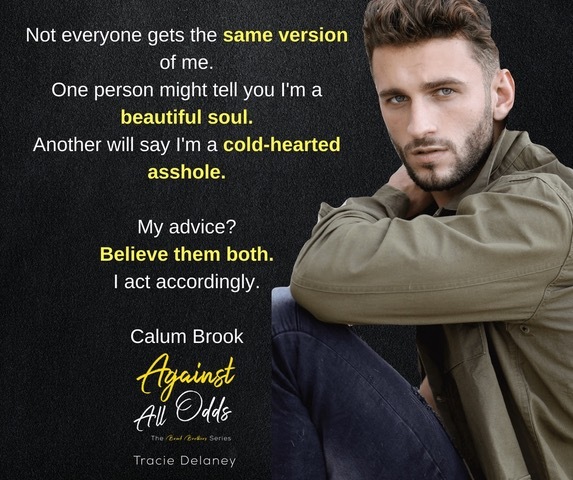 “𝘎𝘰𝘰𝘥 𝘮𝘰𝘳𝘯𝘪𝘯𝘨,” 𝘴𝘩𝘦 𝘴𝘢𝘪𝘥, 𝘵𝘩𝘦 𝘱𝘰𝘭𝘪𝘵𝘦𝘯𝘦𝘴𝘴 𝘪𝘯 𝘩𝘦𝘳 𝘵𝘰𝘯𝘦 𝘴𝘦𝘵𝘵𝘪𝘯𝘨 𝘩𝘪𝘴 𝘵𝘦𝘦𝘵𝘩 𝘰𝘯 𝘦𝘥𝘨𝘦. “𝘓𝘢𝘵𝘦 𝘯𝘪𝘨𝘩𝘵?” 𝘚𝘩𝘦 𝘴𝘵𝘢𝘳𝘦𝘥 𝘢𝘵 𝘩𝘪𝘮 𝘪𝘯𝘯𝘰𝘤𝘦𝘯𝘵𝘭𝘺, 𝘣𝘶𝘵 𝘵𝘩𝘦 𝘮𝘪𝘯𝘶𝘵𝘦𝘴𝘵 𝘤𝘶𝘳𝘷𝘦 𝘵𝘰 𝘩𝘦𝘳 𝘭𝘪𝘱𝘴 𝘨𝘢𝘷𝘦 𝘩𝘦𝘳 𝘢𝘸𝘢𝘺. 𝘏𝘦𝘳 𝘤𝘢𝘭𝘮 𝘥𝘦𝘮𝘦𝘢𝘯𝘰𝘳 𝘪𝘯𝘤𝘳𝘦𝘢𝘴𝘦𝘥 𝘩𝘪𝘴 𝘪𝘳𝘳𝘪𝘵𝘢𝘵𝘪𝘰𝘯. 𝘏𝘦 𝘸𝘢𝘯𝘵𝘦𝘥 𝘵𝘰 𝘨𝘦𝘵 𝘢 𝘳𝘪𝘴𝘦 𝘰𝘶𝘵 𝘰𝘧 𝘩𝘦𝘳, 𝘵𝘰 𝘩𝘢𝘷𝘦 𝘵𝘩𝘢𝘵 𝘧𝘪𝘦𝘳𝘺 𝘐𝘵𝘢𝘭𝘪𝘢𝘯 𝘵𝘦𝘮𝘱𝘦𝘳 𝘢𝘪𝘮𝘦𝘥 𝘪𝘯 𝘩𝘪𝘴 𝘥𝘪𝘳𝘦𝘤𝘵𝘪𝘰𝘯. 𝘏𝘦𝘳 𝘤𝘢𝘴𝘶𝘢𝘭 𝘪𝘯𝘥𝘪𝘧𝘧𝘦𝘳𝘦𝘯𝘤𝘦 𝘸𝘰𝘶𝘭𝘥 𝘴𝘰𝘰𝘯 𝘸𝘦𝘢𝘳 𝘵𝘩𝘪𝘯. 𝘏𝘦 𝘰𝘱𝘦𝘯𝘦𝘥 𝘩𝘪𝘴 𝘮𝘰𝘶𝘵𝘩 𝘵𝘰 𝘳𝘦𝘴𝘱𝘰𝘯𝘥 𝘣𝘶𝘵 𝘸𝘢𝘴 𝘤𝘶𝘳𝘵𝘢𝘪𝘭𝘦𝘥 𝘸𝘩𝘦𝘯 𝘵𝘩𝘦 𝘸𝘢𝘪𝘵𝘳𝘦𝘴𝘴 𝘣𝘳𝘰𝘶𝘨𝘩𝘵 𝘓𝘢𝘶𝘳𝘦𝘭𝘭𝘢’𝘴 𝘤𝘰𝘧𝘧𝘦𝘦. “𝘊𝘢𝘯 𝘐 𝘨𝘦𝘵 𝘵𝘩𝘪𝘴 𝘵𝘰 𝘨𝘰?” 𝘓𝘢𝘶𝘳𝘦𝘭𝘭𝘢 𝘢𝘴𝘬𝘦𝘥 𝘩𝘦𝘳. 𝘓𝘢𝘶𝘳𝘦𝘭𝘭𝘢 𝘴𝘵𝘰𝘰𝘥. 𝘞𝘪𝘵𝘩 𝘩𝘦𝘳 𝘧𝘪𝘯𝘨𝘦𝘳𝘴 𝘱𝘳𝘦𝘴𝘴𝘦𝘥 𝘵𝘰 𝘵𝘩𝘦 𝘵𝘢𝘣𝘭𝘦, 𝘴𝘩𝘦 𝘣𝘦𝘯𝘵 𝘧𝘰𝘳𝘸𝘢𝘳𝘥, 𝘴𝘩𝘰𝘸𝘪𝘯𝘨 𝘵𝘩𝘦 𝘮𝘦𝘳𝘦𝘴𝘵 𝘩𝘪𝘯𝘵 𝘰𝘧 𝘤𝘭𝘦𝘢𝘷𝘢𝘨𝘦. 𝘏𝘦 𝘭𝘰𝘸𝘦𝘳𝘦𝘥 𝘩𝘪𝘴 𝘨𝘢𝘻𝘦 𝘣𝘦𝘧𝘰𝘳𝘦 𝘥𝘳𝘢𝘨𝘨𝘪𝘯𝘨 𝘪𝘵 𝘣𝘢𝘤𝘬 𝘶𝘱 𝘵𝘰 𝘩𝘦𝘳 𝘧𝘢𝘤𝘦. 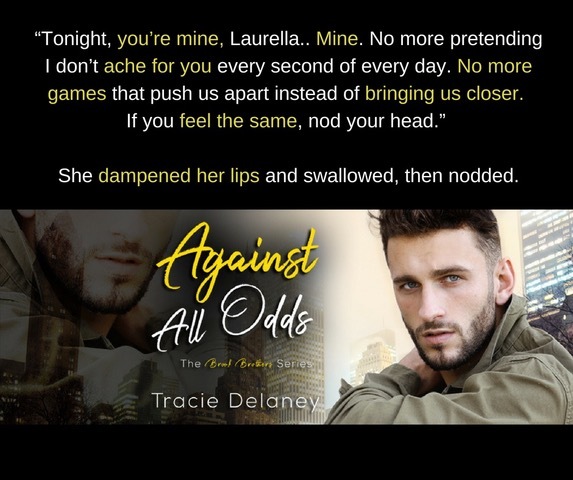 Tracie’s contemporary romance novels center around strong characters and real life problem with, of course, a perfect Happy Ever After ending. When she isn’t writing or sitting around with her head stuck in a book, she can often be found watching The Walking Dead, Game of Thrones or any tennis match involving Roger Federer. Coffee is a regular savior. 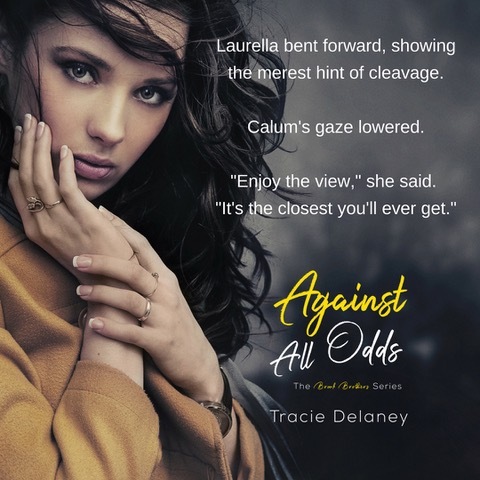 You can chat with Tracie on Facebook (www.facebook.com/traciedelaneyauthor) or Twitter (twitter.com/tracie_delaney), or, for the latest news, exclusive excerpts and competitions, why not join her reader group (smarturl.it/lvtnjm) and those things will be automatically delivered right to your inbox, along with a special gift just for signing up. Tracie currently resides in the North West of England with her amazingly supportive husband and her two crazy Westies, Cooper and Murphy. It definitely sounds like a good one! I can’t wait to read! !